New Delhi, Dec 9 (IANS) Five films old, plenty of critical acclaim but no real box-office success yet... Neil Nitin Mukesh takes everything in his "positive stride" and says he finds it gratifying that his directors are approaching him again to be part of their films. "I don't fear failure at all as it is a step towards success. Failure is something that teaches you and helps to keep you grounded," Neil told IANS over the phone from Mumbai. Instead of making his debut with the usual love story, Neil chose a negative role in the 2007 crime thriller "Johnny Gaddar". Though the film was not a commercial success, both the film and Neil earned critical appreciation. Then followed "Aa Dekhen Zara", "Jail", "New York" and "Lafangey Parindey" -- all average grossers at the box office. "To be very honest I'm delighted with the fact that with all the films I did, the producers of those did not suffer losses. At least they recovered their costs. Moreover, most of the directors I worked with earlier are approaching me again to be a part of their films, which is very gratifying as an actor," Neil, 28, said. He says he is humbled by the fact that he had fans who liked him. "I have given my best always. I have been born and brought up in such an environment where my parents taught me to be neutral. I take everything in a positive stride." Grandson of legendary singer Mukesh, Neil decided to chart a new path and chose to face the camera instead of going behind the mike. "When I was growing up, I had a vision of a larger than life films. All those fights, bullet firings and action sequences always excited me. I have grown up watching Amitabh Bachchan's films like 'Sholay' and 'Trishul'. These films influenced me a lot," he said. "Action is thrilling and where there is thrill, you will always find me," added the actor who performed some dangerous stunts in "Lafangey Parindey". Neil's next is "Tera Kya Hoga Johnny", which is releasing Dec 17. Directed by Sudhir Mishra, the film will see him in the second lead. 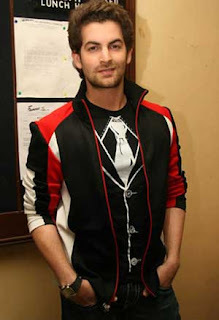 The protagonist Johnny is played by debutant Sikander Agarwal. It is a film where emotions like greed, lust, love, betrayal and hope acquire a new meaning in India's melting pot Mumbai, a city that desperately wants to be Shanghai. The film also stars Soha Ali Khan, Shahana Goswami, Karan Nath and Kay Kay Menon. "Initially when I met Sudhir Mishra, I was scared of him. I felt he would beat me up. But, after working with him, I felt he is a great man, a visionary, extremely dedicated and smooth. Even when he used to get angry on the sets, by the time you would realise he is angry, his anger would disappear. He's like a father figure to me." Produced by Tutu Sharma, "Tera Kya Hoga Johnny" was wrapped up in 2008, but the release was deferred for unknown reasons. There were reports that the actor was at loggerheads with director Mishra over the delayed release, but Neil said firmly: "There's certainly no issue between the two of us. People just like to talk."